Why not enjoy all of our facilities? Why not enjoy all of our facilities by booking a meal in advance of your visit by contacting Julie Hunter our Stewardess who provides a comprehensive menu to suit almost any taste. We shall be delighted to provide a list of local Hotels and Tourist information but the best plan is to take advantage of our 'on course' holiday bungalow which overlooks the 14th green. Further details may be obtained by visiting this page. 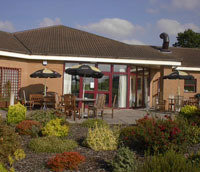 At Market Drayton Golf Club we welcome junior members. Most of our juniors started the game as complete novices however with appropriate golf coaching and tuition together with the leadership of a dedicated junior organiser we now have many Juniors playing golf to a very high standard. Electric buggies are also available upon request by contacting Phil in our well stocked Pro Shop. To practice before your round we have two driving nets, a practice green where you can practice chipping, pitching and putting and a high club driving area. Mulligans is the refuge where members and guests can recollect the pars and birdies that should have been and Stableford points that were “thrown” away and how different it would have been on another day. All of this is enhanced by tea, coffee, soft and alcoholic drinks provided by the mother and son team who are performing a great job as our stewards. Julie Hunter is the mother of Ethan and her experience in the catering trade is on display every day with the wide range of snacks and meals that can be obtained after a round and in the range of snacks that can supplement a cup of tea or coffee. 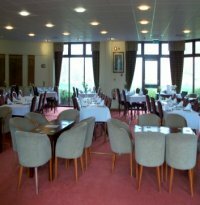 Every month through the winter, the stewards provide a superb carvery, average attendance is over 100, with a choice of two or three courses. Tea or coffee are extra. When the social committee organises a culinary event, needless to say the food produced by the team is exceptional. Mulligans are very keen to make life easy for occupants of the bungalow. The belief is that the last thing a group of exhausted golfers need to do is to provide their own sustenance. Please contact the team on 01630 652266 option 3 to discuss your catering needs. If you want to organise an event at club please contack Julie to discuss room booking and menu.